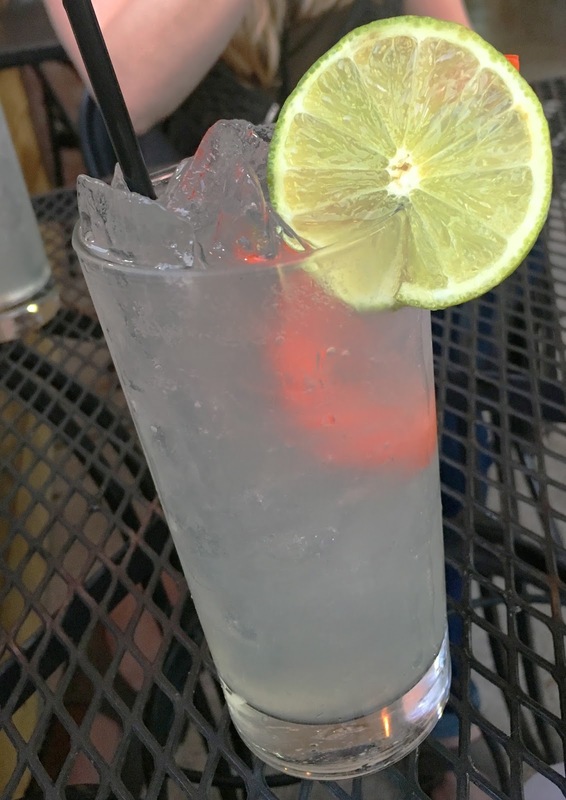 Republic Diner + Sojubang, Plus A Giveaway! This will be my last blog post for a little while because I'm getting married, oh, next week. 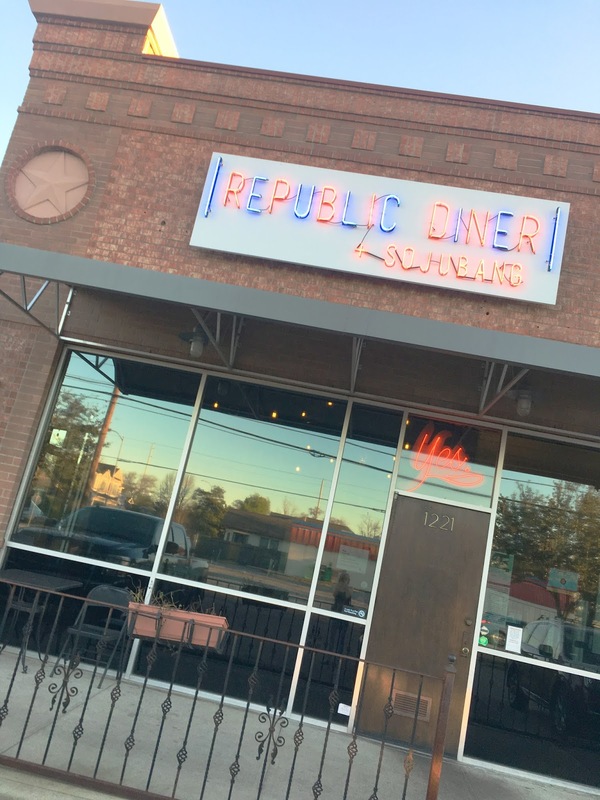 A few weeks ago I had dinner with my friend Heather at Republic Diner + Sojubang, a restaurant located in Houston's Heights neighborhood. We figured we had to start off with some soju (a distilled vodka-esque beverage), so we each tried a soju cocktail containing pepper infused soju. We both went nuts over this drink! It was wonderfully spicy, refreshing, and soul-warming. Think prickly pear margaritas without the tartness of a margarita, and with the crispness of a G&T. Omg LOVE! For our first round of food, we split the kimchi fries (marinated beef on the side) and pajeon. Don't those look incredible? And they were pretty darn good. 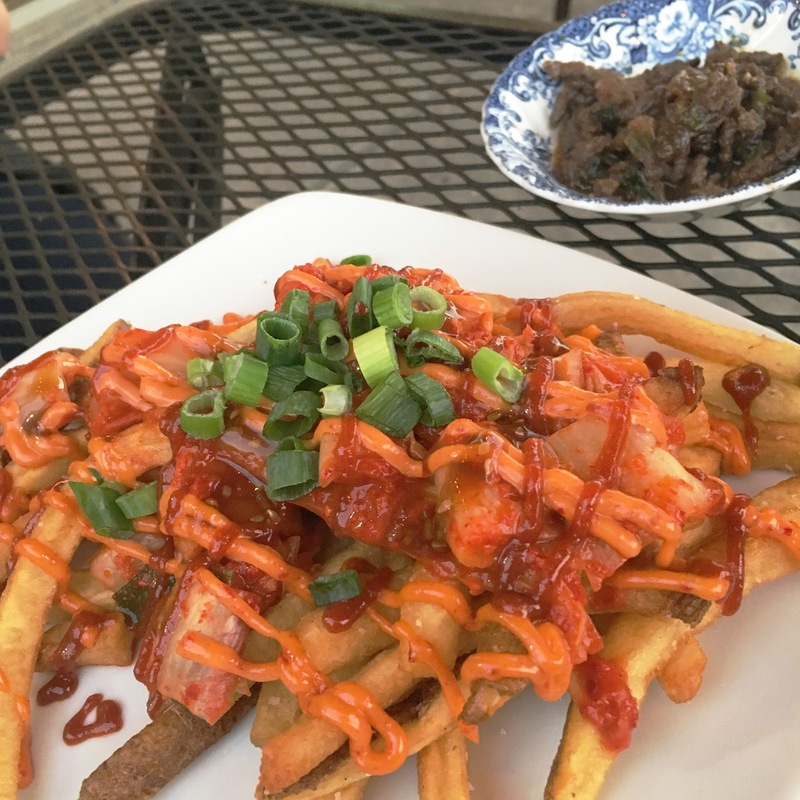 Topped with kimchi aioli, sesame sauce, and scallions, the house cut fries were lively and delightful. I have a feeling the beef brought the fries to an even more elevated level, but the vegetarian version was very satisfying! The pajeon was easily my favorite bite of food that evening. 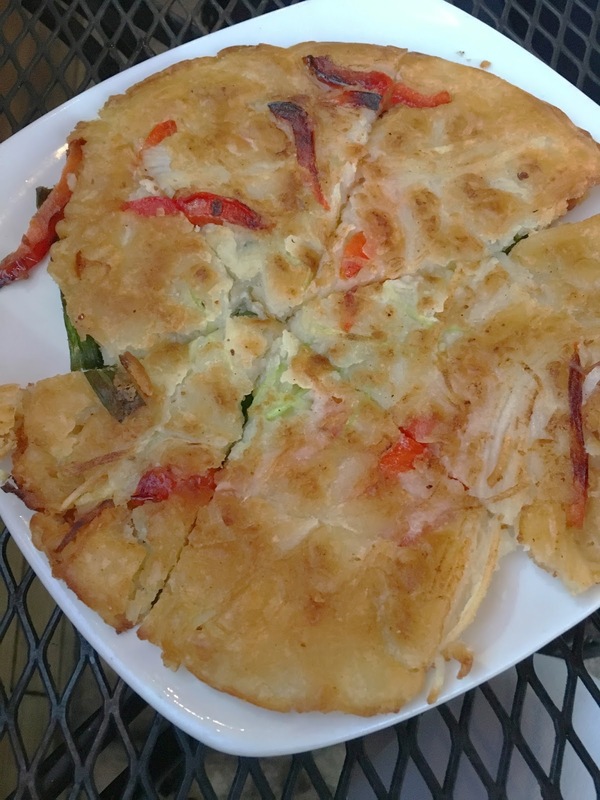 The hearty pancake was stuffed with scallions and red peppers, and was served with a side of spicy soy dipping sauce. And it. was. HEAVEN. The pancake was super dense yet fluffy, and the various different flavors were so savory and insanely delicious. It was so so good, y'all! For my entree, I ordered the kimchi fried rice without the bul gogi (marinated ribeye). While I enjoyed the fried rice, I could have used a bit of sweetness to counter the kimchi, which was very present. Our server offered to add tofu to my dish, which was certainly thoughtful of him, but were I to order it again, I'd go without it, as I didn't feel that it really added anything. 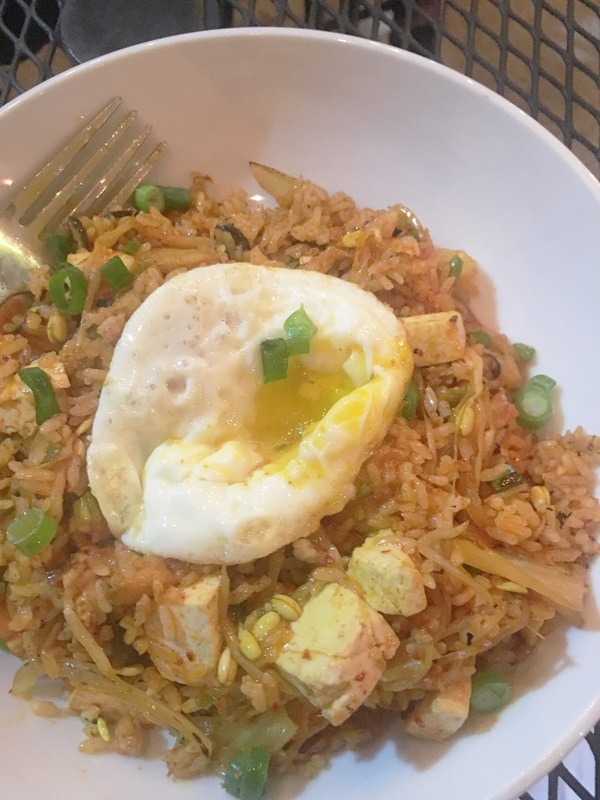 Regardless, it was a satisfying and flavorful entree, and you can't go wrong with anything that's topped with a runny, fried egg! Republic Diner + Sojubang is an incredibly inexpensive Korean restaurant in Houston that offers an array of unique, flavor-popping dishes (TRY THE PAJEON AND PEPPER SOJU FOR THE LOVE OF ALL). It's a great spot that I definitely recommend checking out! The Houston Press Menu of Menus® Extravaganza, presented by Stella Artois, is one of Houston's largest food & wine events, featuring over 40 area restaurants alongside wine, beer, and spirit sampling. 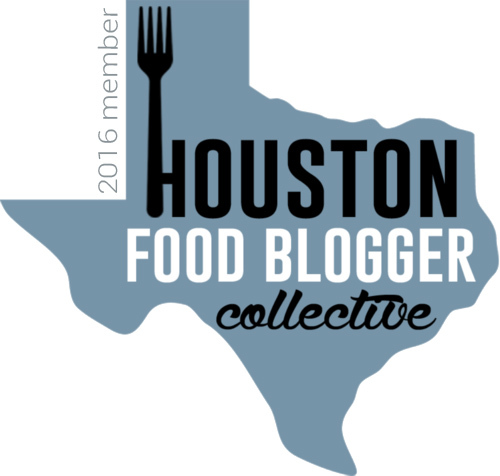 One lucky Adventures in a New(ish) City reader will receive two (2) VIP tickets to this year's Menu of Menus® Extravaganza, held at Silver Street Station in Houston on Tuesday, April 4, 2017, from 7:00 - 10:00 pm. And a VIP ticket (valued at $95) grants you admission to the event one hour early! To enter, go to the giveaway box below, and log in with your name and email address (this will not be posted publicly). Once logged in, click the "Enter Contest" dropdown, and then the "Enter!" button. One entry is allowed per person, and only Houston-area residents are eligible. The contest starts NOW - Wednesday, March 15, 2017, and it ends on Sunday, March 19, 2017 at 11:59 pm CST.